This area of the universe is known as Seyfert's Sextet, although there are really only four galaxies engaged in this particular cosmic turf war. First spotted by astronomer Carl Keenan Seyfert, these tightly packed galaxies represent the most compact group ever discovered, as the space they occupy would barely be enough to fit in our entire galaxy. The sextet actually contains only four interacting galaxies, though. Near the center of this Hubble Space Telescope picture, the small face-on spiral galaxy lies in the distant background and appears only by chance aligned with the main group. Also, the prominent condensation on the upper left is likely not a separate galaxy at all, but a tidal tail of stars flung out by the galaxies' gravitational interactions. About 190 million light-years away, the interacting galaxies are tightly packed into a region around 100,000 light-years across, comparable to the size of our own Milky Way galaxy, making this one of the densest known galaxy groups. Bound by gravity, the close-knit group may coalesce into a single large galaxy over the next few billion years. 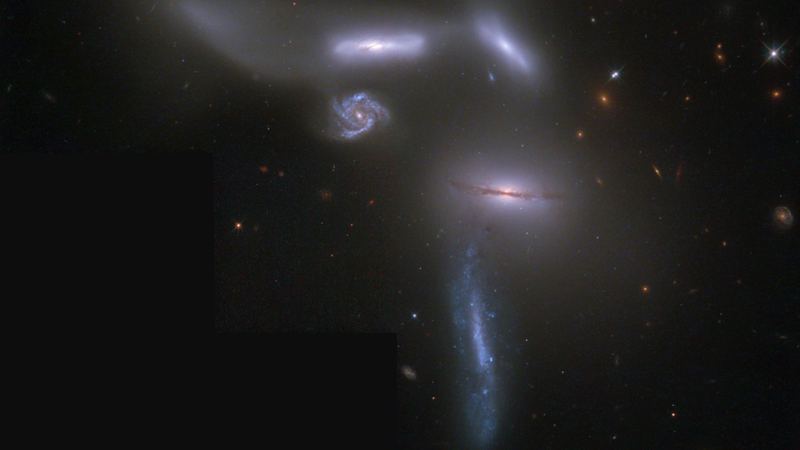 Seyfert's Sextet, a grouping of (as the name implies) six galaxies in the constellation Serpens, is an interesting example of a discordant redshift group. Five of the members show very similar redshifts, from 4000 to 4500 km/s, while the fifth is measured at nearly 20000 km/s. Conventional wisdom argues that this is a chance projection of a distant background galaxy: some would have otherwise and require a complete rethink of modern cosmology and the introduction of completely new physics. And on that not at all disquieting note, I'll leave you to your holiday festivities.